It was a pleasure to speak at our annual Benefactors Service this week and to host some of our benefactors in the new Annandale function room afterwards. I also spoke to the Secondary School about the importance of benefactors and giving to something bigger than ourselves. In outlining the history of Annandale, I spoke of Walter Annandale Jack, after whom the building is named. Like the boys, you might be interested in a brief history lesson on both the building and the man. Our new sports pavilion is the third iteration of Annandale, with all three versions having occupied the southeast corner of the Crowther Oval. The first Annandale, a single-level structure, opened in 1956. It was in use until our centenary year of 1982, when a two-storey structure doubled the size of the original. This centenary Annandale, with which most of you would be familiar, was demolished last year and we have been watching with excitement as the next iteration has grown. The boys are now making the most of the cutting-edge facilities at the ‘newest’ Annandale. Walter Annandale Jack is a key figure in our 136-year history. He was an Old Boy, entering BGS in 1885 and leaving in 1892. He went on to be President of the Old Brighton Grammarians’ Society, a member of the School Council from 1925 and Chairman of Council from 1948 through to 1965. Crucially, he was a benefactor in the School’s 1924 incorporation – a key change that secured the ongoing viability of Brighton Grammar School. We look forward to welcoming you to the official opening of Annandale early in 2019, when we will continue to honour the significant legacy of Walter Annandale Jack. This week our Junior School community has come together to see the Year 6 boys join together with our Firbank ‘sisters’ to shine on stage as Once on This Island Jr comes to life. There was real excitement for boys and girls as this week progressed through the various stages of ‘Performance Week’ to the opening show. The standard of Once on this Island Jr is extraordinary. At times throughout the first performance last night, I needed to remind myself that these were primary-aged children performing! Congratulations to all Year 6 boys and Jared Furtado, Karla Nyhuis, Hayley Blakiston, Monica Le Couteur, Cathy Box, Luke Fensling and Hamish Leahy, Paul Ciempka, Amy Russell and Janet Nieuwenhuis. To those of you who are fortunate enough to have a ticket for the final performance tonight, I know you will enjoy the entertainment! Last Friday’s Junior School Gala Ball was an outstanding night. There was a great sense of community, the room had a ‘wow’ factor. Thanks to our hosts Hatem and Agnese Saleh and the Atlantic Group, the night was superbly organised by our convenors Brigitte McGregor and Leonie Vincent and the Ball Committee; Valentina Zuban, Agnese Saleh, Michelle Chilcott, Kerstin Barber, Basia Quill, Nick Bulfin, Kirsty Davis and Jessica Luketic. Thanks you to our sponsors, Atlantic Group, Lexus of Brighton, Ivy & Eve Flowers, Green & Sternfeld, Shaw and Partners, StarRez and to all families who were able to support the Ball with donations for auction items, purchasing raffle tickets and your support on the night. Approximately $65K was raised which will assist with the refurbishment of our Drama Space. In the last 18 months, we have upgraded our Years 5 and 6, Music, Learning Support, Library, Prep–Year 2 and Design and Technology spaces. We are delighted with the ‘look and feel’ and the end result. We will continue to upgrade our facilities, with the next stage being the Years 3 and 4 (Middle Primary) classrooms and the Drama space. This refurbishment will occur in three stages, commencing at the beginning of Term 4. Term 3 Interim Reports will be available to parents of all Prep to Year 6 boys from Thursday 20 September. These reports do not assess achievement; instead, they focus on attitude, effort and the development of various personal and social skills. These reports will be available online via the Synportal. Next week, I will be visiting our boys while they are on exchange at Hangzhou Changjiang Primary School in Hangzhou, China. Dean Bryan will be responsible for the Junior School in my absence. How blessed we have been this week with Melbourne’s weather to support our outdoor programs. The Wallaby class enjoyed a beautiful morning on Tuesday down at the beach, exploring the area and looking for treasures along the way. Our sports program has been focusing on footy skills in preparation for next week’s Footy Day. On Thursday 20 September, the boys can come dressed in their team colours with their sports shoes, ready for their training drills with the BGS Footy First team. This event is always a highlight within our program and a wonderful reminder of how lucky we are to be a part of the BGS Community. 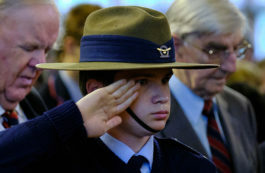 Our ELC3 Fathers’ Night last Thursday was a memorable event for the Bilby and Wombat boys. The dads and special guests were enthusiastic about getting involved in all the activities, and at the end of the night, we enjoyed reading through handmade comic books and laughing along with their ‘dad jokes’. We again thank all of our ELC dads for joining us and for guiding these boys to be wonderful men in the future. On Wednesday, all the ELC boys were invited to watch the dress rehearsal of the BGS/FGS Year 6 play. We welcomed the ELC girls from Firbank to join us. What fun we had being big boys in the audience! Troy Cook (Year 9) is doing his work experience in the ELC at the moment. The boys loved finding out how to play the didgeridoo. We look forward to a fun-packed last week of term next week. A reminder that if you are enrolled in the 48-week Long Day Care Program, you are required to return the attendance form to Kirstie McCormick or me. All boys have shown wonderful growth in their performance skills and confidence in the creation of their pirate character. By watching videos of themselves taken during lessons, boys have been able to identify and immediately modify aspects of their character. They have also needed to employ a growth mindset in order to listen carefully to feedback from their peers and set goals for improvements in their next lesson – both individually and in their small group. Watch out if you are walking past the Year 2 rooms – there are some very fearsome pirates around! The boys of Prep Fivedale were incredibly excited to welcome 10 feathered friends into their room this week. While waiting for the chicks to hatch, the boys spent time unpacking the word ‘feather’, and discovered that it contains one graph and three digraphs! Throughout the day, students have taken turns checking in on the eggs and providing the class with updates. The boys have set up a viewing area and many have preferred to eat recess and lunch while watching the chicks break out of their eggs. The boys have enjoyed keeping a daily journal and reading the complete series of Mr Chicken. Concerts showcase our spectacular musicians! 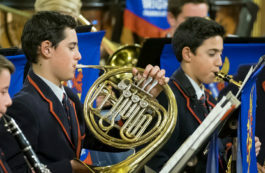 Last week, over 300 students from Years 4–12 performed in the Strings Spectacular and Bands Showcase concerts. These events, affectionately referred to as the ‘Journey’ concerts, highlight the musical journey that the boys can enjoy as they move up through the various levels of the School. It is also an incredible opportunity for the younger students to witness the skilful performances of our senior-most ensembles. On Tuesday night, the Strings Spectacular featured our orchestras and chamber string ensembles. Performances included music from several countries and cultures, such as the lively rendition of Taco Time by the Wilson House String Orchestra, which included some lively “olé’s” from the orchestra. The Intermediate String Orchestra brought life to the powerful music of John Williams, and the Corelli String Orchestra featured solos from several of our senior string musicians. A highlight of the night was the Senior Symphony Orchestra’s performance of Lord of the Dance, a melody dear to many BGS hearts. The Bands Showcase followed this on Thursday. Our concert bands and jazz ensembles filled St Andrew’s Church with the incredible music of composers including John Williams and Stevie Wonder. Film soundtracks featured again, with the Intermediate Concert Band playing highlights from Transformers, and the Wilson House Concert Band performing John Williams’ Theme from Jurassic Park – a favourite of many. Senior Big Band brought back the sound of the ’70s with Stevie Wonder’s Superstition, and the Senior Concert Band closed the concert with a dazzling performance of El Camino Real, a benchmark work in wind band literature, which challenged the boys both musically and physically. On behalf of the Music Department, I would like to congratulate all of the boys for their terrific performances, which were a testament to their dedication and passion for developing their musical craft. I would particularly like to thank the Year 12 musicians, as for many of them this was their final school concert; their service and contribution to the music program over their time at Brighton Grammar has been remarkable. Finally, I would like to thank the parents of all of our music students, and the wider BGS community, for their ongoing support of the music program. We look forward to seeing many of you at our remaining concerts and the Community Carols Service on 3 December.